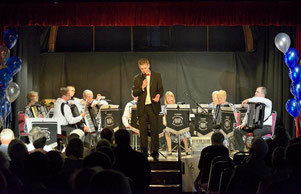 July 2013 - Website of kennetaccordionorchestra! The players are enjoying a well earned rest following an exhilarating weekend which saw KAO performing two concerts, firstly in Devizes on Saturday evening at St Andrews Church, followed by our annual HADCAF concert at Croft Hall, Hungerford on Sunday. Having spent the last few months in rehearsal, the orchestra were pleased to debut a number of new pieces at these concerts, including arrangements of Where Eagles Dare, Deep River and The Final Countdown, with fantastic audiences making both evenings very enjoyable. It was also a pleasure to welcome two guest artists to the HADCAF programme, with Alison Brunning performing a Clarinet arrangement of Acker Bilk’s Stranger on the Shore (supported by the orchestra) and also David Pasby (son of MD Nigel) joining the orchestra to perform guitar for a number of items. Thank you to all who were involved in supporting and making both evenings such a success.